EDIT: Valentine GiveAway + Twit for extra Entries! But it would be an easy one ok!?! If you are lazy to read. See my Video! Feel like you understood everything?! Scroll down to fill out the form!!! #1 Leave a comment in this blogpost to let me know you joined the Giveaway! #2 Be a Public Follower on my blog. If I don’t see your icon there on the top there then it doesn’t count ! Any problem in the form please Email me at hitomikat@gmail.com. However, don’t send me info there to enter the giveaway! Only the contest part should be send to me via Email. EDIT: I did not receive much Valentines Day look. I wanted at least 20 people before I can open the contestant. If you still want to do the look is fine, but just remember I can’t open the contest until I have 20 people. Instead, I open the twit option! Twit everyday for extra entries!! you may still enter if you already made the look, otherwise, for quick extra entry, do a twit everyday !! #1 Topic is Valentine Look. #2 : Create the look yourself with Makeup or Outfit, or you can do both together, that’s up to you. With the Valentine Look, it doesn’t have to be pink or red. It’s whatever colors and style you want for your own valentine look! #4 : Please also submit your name, blog address and title for the photo. Optional: You may also write a story about your look if you wish. It can be long or short, whatever you feel may gain more votes! # 5: You must be a public follower on my blog and like my FaceBook Fan page to qualify. #6 : Once the Photo submission time is closed. I will create a link on FB for all the contestant’s picture and information. You may ask your friends to vote for you by liking your photo! Voters MUST like my FaceBook for their votes to count! Note: You can use an old photo of yourself if you wish. But it has to be a photo of you with a look that you would wear for valentines day! ( cannot use baby photo or any photo that I cannot recognize it’s you) & also still show your face to prove that it’s a look you created yourself. People who steal pictures to join the contest will be disqualified. I will keep the entered photo contest until Jan 28th. If I get more then 20 contestants by that time I will post all the photos via FaceBook page. Email you so you can start having all your friends to vote for you! This is just to make it more fair, for the contest, but you can still join the contest after Jan 28th. Final Deadline for all Giveaway Submissions is on Valentines Day ! Feb 14th 2012 ! This Giveaway is for USA only! also, what is the difference in the BB Cream 23 or 31? Is one of them lighter? yay! cant wait to enter! Hi Love~ Ur welcome. I will be announcing the winner via Blog & Email! So that’s y I ask for Email so I can track you down if you win! Hi Love~ Ur welcome.& It’s ok~ I will be announcing the winner via Blog & Email! So that’s y I ask for Email so I can track you down if you win! Oh by the way, my email is rebeccatsang54@yahoo.com, and again, thanks for the giveaway! **AAwww** Your giveaway is adorable! And your blog too! great video, love your blog! wow, thank you for this giveaway, everything is really cute ! And you are so pretty ! 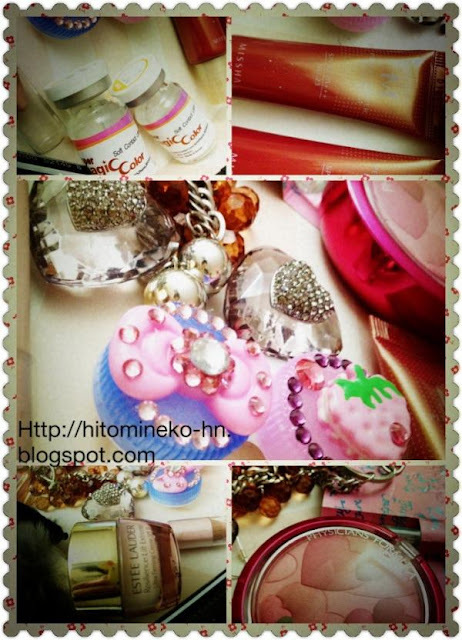 Well anyway, Missha BB Cream # 23 and the Sweet and Lovely Contact Case, I really liked the lenses case.. I'm from Canada, so scratch me out ^^ You are so sweet to be hosting this giveaway though! =D thank u ! & thx for joining ! Thanks for your comment!!! Love your page super cute!!!! Join my blog and youtube channel to look out for my latest and greatest!!!! Thx Love for joining ! <3 yay ! hi hitomiii <3 i lovvvve ur stuff i am seriously inspired :))). i really want the conact lenss and case :) . Opps! It messed up my email!! Thanks for adding me as a friend on Michelle Phan's site (I'm GEN). Best of luck to everyone! *facepalm* Egads. Sorry, and I'd like BB Cream in #23 and the contacts case with the strawberry. Hi Hitomi! Your blog is SO cute! I really want to do your Valentine GiveAway Contest but sadly I will not be able to do so, but thanks for the heads up on Michelle Phan's site. =D Thx for entering! have a wonderful day ! =D Thx glad you like it~ have a wonderful day ! aww ~ <3 sorry~ but I will have more giveaway throughout the year~ perhaps I will make next one worldwide. !! Thx for the awesome comment ! Have a wonderful day !! i dont know if i gave you my emailor not but here it is anyway duncantaelyn@rocketmail.com....So when you choose the winner will you email the winner? I entered the giveaway! I sent you an email of my Valentine's Day Look pic! email: katsuki87gmail Love your giveaway, and definitely gonna try my luck! Fantastic giveaway! Thank you for hosting this! Thx Love ~ <3 Good luck! But i have one question.. are we supposed to comment with our choice in cream & contact case as well? Because i see people doing it and i didn't see it in the post (unless i overlooked it). But if anything is BB cream 31 darker/yellower than the other? or is my computer just being.. itself >.>.. again? I suit the lightest skin tone there is but I'm not picky with anything, I'm just really grateful for the giveway. Unfortunately i cannot take part as live in the uk but still did steps and liked facebook and followed just for support. #23 should be match my skintone and any case is fine! I also put your giveaway on my sidebar! -Contacts case #104, i love CUPCAKES!!! 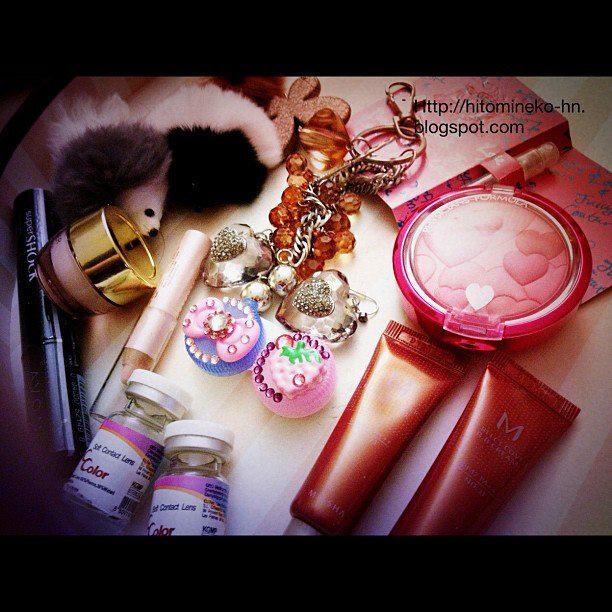 -I would prefer #23 BB cream would be nice! and Contact Case: Super Cute in Pink Case Deco 101!